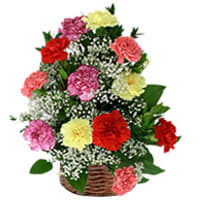 Merge your love with this Radiant 15 Mixed Carnations Decked within a Basket and send it to your dearest ones. Fresh Mixed 12 Carnations in Basket and Assorted Cadburys Chocolate. Fresh Mixed 12 Carnations in Basket with 500 grms Assorted Sweets. Fresh Mixed 12 Carnations in Basket with 16 pcs Ferrero Rocher chocolate box.